Home/Proxies/Private Proxies/HTTP vs. SOCKS Proxies: What’s the Difference? If you’re new to the world of private proxies, it can seem a little overwhelming. Proxies have a lot of moving parts, and unless you understand what those parts mean, you won’t get the most out of the service. Fortunately, if you spend a little bit of time educating yourself about the various components of private proxies, you’ll have a working understanding of what proxies are, and that will make it easy for you to use them to your advantage. That way, you can use them to watch movies, run bots, scrape Google, buy sneakers, or anything else that you want to do. When you first start using proxies, you’ll notice that HTTP and SOCKS protocols (and various versions thereof) come up a lot. Blazing SEO is one of the few services that supports all protocols. That’s great and all, but unless you know what these protocols are, it doesn’t really mean a thing. Let’s take a look at what these protocols are so you’ll understand how they impact you when you’re using proxies. Then, we’ll go over a few tips so you can set these protocols up running. At that point, you’ll be ready to use a SOCKS or HTTP proxy. When you use a SOCKS proxy connection, you’re basically using a general-purpose connection. Think of this as the default connection that most proxies use. This is a very basic connection that establishes a TCP connection with another server on the client’s behalf. Then, it uses that connection to route traffic between the client and the server. People typically use this type of connection because they are operating behind a firewall and the only way to establish TCP connections outside of the firewall is through a SOCKS server. Also, because the SOCKS protocol doesn’t penetrate the data, it can work with any type of connection. That means you can use this with networks that use HTTP, POP3, or anything else. You don’t have to worry about compatibility issues with SOCKS. In most cases, you’ll use a SOCKS4 connection. This is the basic SOCKS connection. You can also go with a SOCKS5 connection, though. If you want additional security but you want to stick with the SOCKS protocol, you can go with a SOCKS5 connection. Also available with Blazing SEO, the SOCKS5 protocol provides various authentication options that you cannot get with the SOCKS4 protocol. If you like the ease of use of SOCKS but you need extra security, this might be the right option for you. While the SOCKS protocol might be the default option, HTTP proxies still the most common of the protocols. These protocols operate at a higher level than SOCK protocols do. While SOCK proxies can work with any type of site, HTTP proxies can only process requests from applications that use the HTTP protocol. This limits how you can use HTTP protocols. When you see this, you probably think, “I’ll never use an HTTP proxy, then. The limits sound infuriating. I want to log into my proxy and surf the web without any problems.” Here’s the thing, though. As with most things in life, the limits come with rewards. HTTP connections have the ability to interpret data in a way that SOCKS protocols cannot. That can save a ton of time if you’re scraping data. For instance, if you’re going to spend time scraping data from Amazon or Google, your HTTP proxy might be able to avoid downloading some information into your scraper, all because it can interpret it. That will save you a ton of time when you have to go back and interpret the data. If you don’t want to sift through a lot of pointless data, you’ll need to use HTTP protocols when scraping. Otherwise, get ready to dedicate a lot of time to sifting through meaningless data. You don’t have time to spare, so it’s a good idea to use HTTP proxies for scraping. 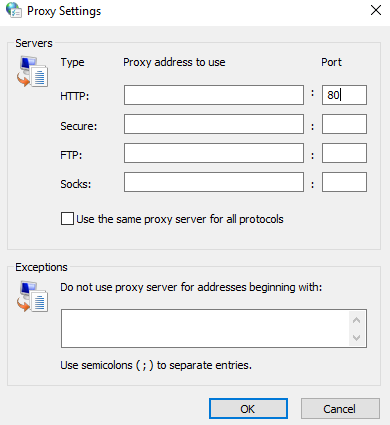 Just like the SOCKS proxy, HTTP connections also have a secure option. If you have to transmit secure data, you’ll need to use an HTTPS protocol. If you are using your proxy to transmit any type of banking information or any other sensitive information, upgrade to the HTTPS option. That will provide you with an extra layer of security so you won’t have to worry about someone running off with your information. This is only necessary if you are transmitting secure information. Whenever you buy a private proxy, you have to set it up in your web browser. You’ll have to add all of the settings. That includes the port. A lot of people get stuck on this step because they don’t understand that the port they choose has a lot to do with the protocol they use. They try to use the same port across the board, and then they don’t understand why they can’t get online. First, it’s important to understand what a proxy’s port is. Your computer has a bunch of different ports. These ports aren’t physical locations. Instead, they are virtual locations inside of your computer that you can access with numbers. When you assign your proxy a port number, you’re giving your proxy access to the information inside of that port. This is critical if you’re going to get online with your proxy. HTTP protocols typically use port 80, while HTTPS protocols almost always use port 443. SOCKS protocols can typically use any port on your computer. It’s up to you to configure the port to meet the needs of the destination. However, the default port is 1080. If you aren’t sure how to configure the proxy, set it to the default port and try to get online. In most cases, you’ll be able to get online without any problems. What Protocol Should You Use for Various Tools? If you’re new to proxies, get ready to be amazed. There are tons of tools out there that you can use to make your experience even better. You might experience some frustration using the tools if you don’t use the right protocol, though. While you’ll be hard-pressed to find tools that won’t use the HTTP protocol, some don’t use SOCKS. Take a look at tools that only use HTTP, as well as tools that work with HTTP and SOCKS. That way, you will have the right protocol in place whenever you access the tools. Keep in mind that this isn’t an exhaustive list. Always check the requirements before using a new tool. ScrapeBox is probably the most popular tool you’re going to access with a proxy. Its tagline claims that it is the “Swiss Army Knife of SEO,” and it lives up to that. You can use it to harvest keywords, search engines, proxies, and comments. It also checks links, downloads videos, creates RSS feeds, extracts emails, and more. Basically, if you have an SEO task that you want to have completed quickly, this tool can get it done. Best of all, it works with HTTP and SOCKS, so you don’t need to change your protocols out to get started. There is one thing to keep in mind, though. Not all companies that offer private proxies let people use third-party software with their proxies. They do everything they can to block the software for some reason. Blazing SEO is open to all third-party applications, though, so you can run ScrapeBox and other software without a problem. You can use the HTTP or SOCKS protocols with Xrumer. This is another great choice if you need an SEO tool. This tool places links and ads on a variety of platforms, including blogs and guest books. It can find and fill in the various fields so you don’t have to worry about it running into any walls that will keep it from completing the tasks at hand. While this isn’t nearly as powerful as ScrapeBox, it’s a nice addition to your social media campaign. It will help you gain some traction online, so definitely check it out if you want to create a powerful campaign. Tweet Attacks Pro is also a popular choice. If you want to manage multiple Twitter accounts using Tweets Attack Pro, you’ll have to switch over to the HTTP protocol. This is necessary because of the authentication requirements that Twitter has in place. Because of that, you can expect the same with other Twitter tools, as well. If you’ve never used Tweet Attack Pro, you’re in for at treat if you manage a ton of social media accounts. You can run thousands of accounts at one time with this handy tool. Because it’s automated, you can run the accounts 24 hours a day, 7 days a week, even when you’re sleeping or on vacation. This tool has a ton of features, including auto-follow, favorite, tweet, retweet, and more. It makes it appear that a human is running the accounts, even though it’s being operated by the software. That way, you don’t have to worry about sticking out like a bot, which means you don’t have to worry about Twitter banning you. Also, the software is split into modules, and it lets you combine the modules to complete various tasks. This lets you complete any task that you want on Twitter. You won’t get this type of control with many other Twitter tools on the market. This makes this a great option for anyone who wants to control a bunch of Twitter accounts at once. If you want to be a social media pro, check this tool out. It will help you take on a bunch of clients at once. It’s also a great tool if you want to use bots and proxies to promote affiliate products since you can create separate accounts for each product and then promote them like crazy. Twitter Mass Account Creator is another excellent Twitter tool. Along with making it easy to create a lot of accounts, it has a smart username mapper so you can create accounts that look real. That is essential if you’re going to stay up and running. You don’t want to get your accounts pulled, so this is crucial. It also offers custom sign-up details and an account confirmation module. The software confirms the accounts for you so you don’t have to mess with the process. That saves you a lot of time, especially if you intend to set up a lot of accounts at one time. It even automatically removes any of your blocked IPs. This occurs when you try to set up too many accounts with the same IP address. If you’re using a proxy from Blazing SEO, you can then submit those proxies back to us, and we will replace them for you. As you can probably tell by now, social media is where you’re going to have a real problem using SOCKS. Due to Facebook’s authentication processes, you’ll need to stick with HTTP to use Facebook Devil. This account creator tool is a great way to create various Facebook accounts easily. Set up the tool and start creating your accounts. Now that you know a little bit more about proxies, you likely feel more comfortable about using them. Keep in mind that you don’t need to know every little thing there is to know about proxies to use them. However, the more you know about them, the easier it will be for you to get the most out of them every time you log onto your computer. Whether you want to scrape the internet for information or you just want to bypass the Great Firewall of China so you can do some browsing the next time you’re on a business trip, the more you know, the easier it will be to use your proxy.